If you wanted to be more objective about student and professor evaluation, you would have standardized measures of student performance across professors. In the rare case in which this is done, we learn all sorts of fascinating things, including things which raise questions about the unintended consequences of our evaluation systems. Tyler Cowen points me to a paper in the Journal of Political Economy, by Scott E. Carrell and James E. West [ungated version]. The overall pattern of the results shows that students of less experienced and less qualified professors perform significantly better in the contemporaneous course being taught. In contrast, the students of more experienced and more highly qualified introductory professors perform significantly better in the follow-on courses. Student evaluations, unsurprisingly, laud the professors who raise performance in the initial course. The surprising thing is that this is negatively correlated with later performance. In my post on Babcock’s and Marks’ research, I touched on the possible unintended consequences of student evaluations of professors. This paper gives new reasons for concern (not to mention much additional evidence, e.g. that physical attractiveness strongly boosts student evaluations). That said, the scary thing is that even with random assignment, rich data, and careful analysis there are multiple, quite different, explanations. The obvious first possibility is that inexperienced professors, (perhaps under pressure to get good teaching evaluations) focus strictly on teaching students what they need to know for good grades. More experienced professors teach a broader curriculum, the benefits of which you might take on faith but needn’t because their students do better in the follow-up course! final, more cynical, explanation could also relate to student effort. 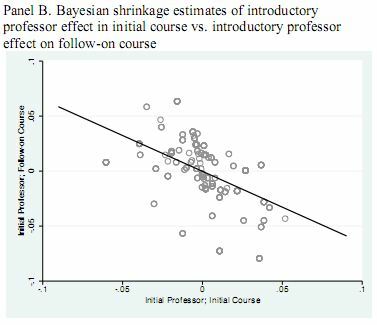 Students of low value added professors in the introductory course may increase effort in follow-on courses to help “erase” their lower than expected grade in the introductory course. Indeed, I think there is a broader phenomenon. Professors who are “good” by almost any objective measure, will have induced their students to put more time and effort into their course. How much this takes away from students efforts in other courses is an essential question I have never seen addressed. Perhaps additional analysis of the data could shed some light on this. Added: Jeff Ely has an interesting take: In Defense of Teacher Evaluations. Added 6/17: Another interesting take from Forest Hinton. For as long as i’ve read books (which admittedly isn’t actually nearly as long as most people in this line of work), i’ve had a strong preference in the whole endnotes versus footnotes debate. * I actually read them. So, i find it incredibly annoying when they’re all tucked away in the back of the book somewhere, nowhere near the content to which they actually apply. I’m sure there are folks out there who prefer endnotes, if that’s you, can you share why? I’m genuinely curious. In the comments on a previous post, dadakim raises a pertinent question about publishing practices that hasn’t (yet?) been adopted in sociology (other than by SMR*, as far as i know). I re-raise it here in case you missed it because i’d be interested in reader reactions to the idea. But the motivation for this post was actually an unrelated publishing issue has been bugging me for a while. Why is it that news articles that mention scientific research don’t have to detail their sources? This is one practice i’ve never understood. I get elated when i see articles that actually go ahead and source the original materials, which is sad, since i think it should be SOP. *See the last paragraph of the guidelines.